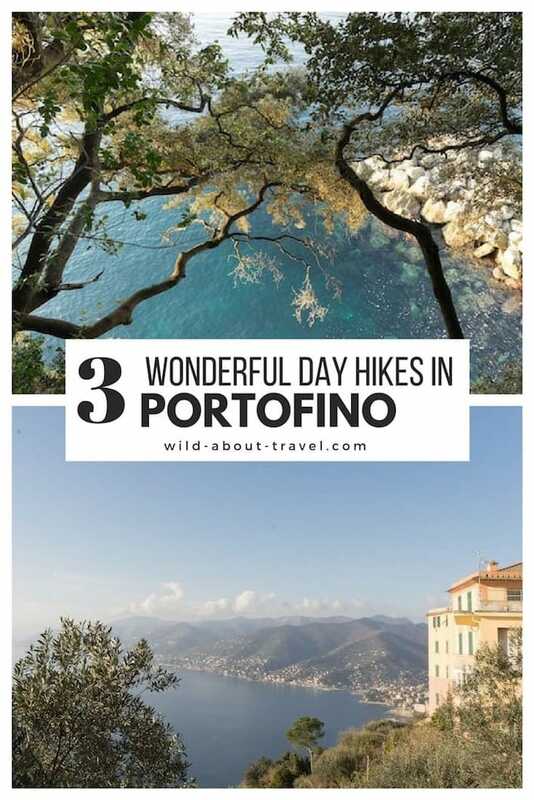 Forget the Cinque Terre and go hiking Portofino! 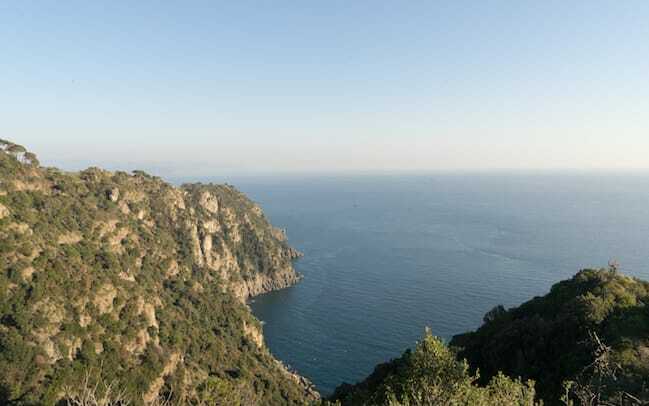 All right, this might be a bit of an overstatement – after all, the Cinque Terre is one of the most popular destinations in Italy for international travelers – but believe me, the area of Portofino Natural Park is beautiful. Provided that you go off-season. But this is true almost everywhere in Italy if you want to beat the crowds. Established in 1935, Portofino Natural Park offers more than 70km hiking trails, some of which are old paved paths used in past times to walk to places of worship. There’s a wide choice of short or longer walks, and while beside a couple none of them is strenuous, the trails go uphill and downhill quite a bit, depending on your starting point and itinerary. That’s the beauty of this area: a rugged landscape with slopes steeply dropping in the cobalt blue sea, thick Mediterranean scrub, man-made terraces where the silver leaves of the olive trees gleam in the sunshine, and isolated small coves surrounded by rocky scarps. Portofino Natural Park is surrounded by charming, colorful towns like Camogli – once a fishermen village and now a popular beach resort during weekends – and Portofino, one of the most exclusive (and expensive) destinations in Italy. With its beautiful houses circling the small cove or towering from atop the cliffs, Portofino hosted many important people and celebrities, like Sir Winston Churchill, Liz Taylor, Richard Burton, Ava Gardner, Humphrey Bogart, Robert De Niro, Liza Minnelli, George Clooney, Madonna, Denzel Washington and others. The setting is totally different, but in terms of celebrities and jet-set, Portofino reminds me a lot of Gstaad, in Switzerland. In winter you’ll see very few tourists, but since the climate on the Riviera is mild, the weather can get really pleasant as early as March. Around Easter, Portofino, Santa Margherita Ligure and, a little less, Camogli, start to get busy during the weekends. Many well-off people open their holiday homes in the area, others have boats moored at the local harbors and start sailing around. Most of the “regulars”, though, won’t go hiking, and the same happens with many tourists. The area of Portofino is well known as an exclusive sea resort, and only a few know that you can make beautiful hikes with superb views. 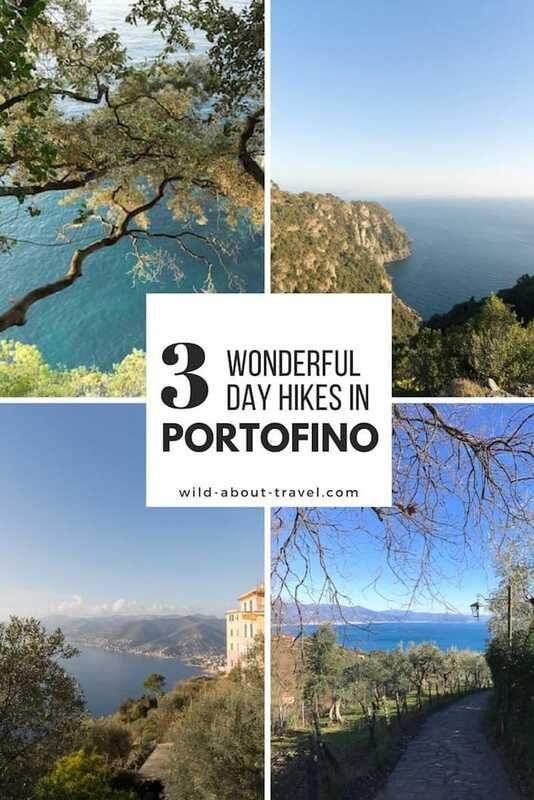 Hiking Portofino Natural Park you’ll find out that it’s not all about expensive hotels, big yachts, exclusive parties, and showing off the latest fashion attire. 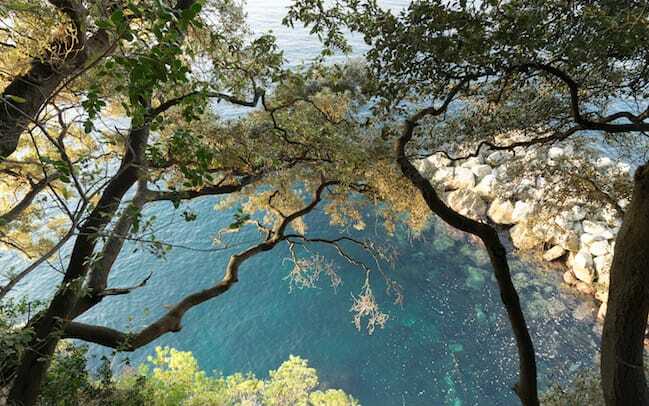 It’s the “no glamour” what I like when I go hiking Portofino Natural Park. Part of this area is still rural, and it’s the most fascinating. As I hike, I like looking at the farmers working their land, and listening to the locals speaking a dialect so tight that I can barely understand it. Life is not easy in those isolated hamlets that you can only reach on foot or by motorbike, driving along the narrow and steep pathways. 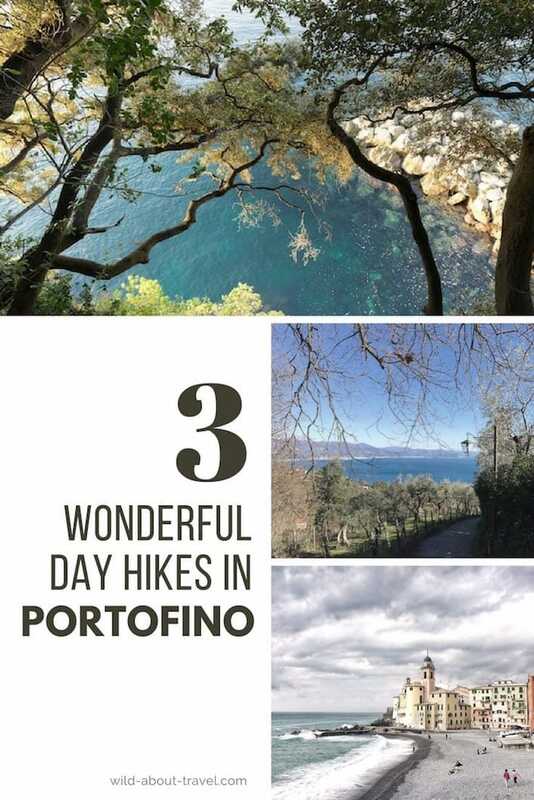 I walked most of the trails of the Portofino promontory, and although all are pretty, there are three of them which stole my heart. The trail, marked with two red dots, starts near Camogli train station and the main parking. The first leg goes all the way uphill to San Rocco, a fraction of Camogli, through a narrow path, mostly made of steps. While you won’t be able to look at the sea, mostly on your back, you’ll walk by many rural houses, getting a first glimpse of how the town looks like as soon as you leave the center. About halfway, you’ll pass on your left a house that I particularly like, because there are always plenty of cats peacefully sitting outside, curiously looking at you. After about 40 minutes, you’ll start seeing the first colorful houses of San Rocco and, at the end of the first stretch, the church and a wide terrace on your right with an amazing view of the coast. It’s a beautiful spot to catch your breath, sitting on a bench and taking in the superb landscape, before continuing the hike. Several trails start in San Rocco, and you’ll need to follow the one leading to Punta Chiappa, this time downhill, to a narrow strip of dark rocks. I like staying there for a while, listening to the waves crashing against the rocks and watching the seagulls flying around and plunging into the water to catch their food. You can sunbathe, swim and a have a picnic, but keep in mind that there’s no shade. Along the path from San Rocco to Punta Chiappa there are a few bars/restaurants where you can make a pause for a drink or a bite. They don’t come cheap, and they’re too touristy in high season to expect great food, but some of them have magnificent views. If you don’t feel like walking back all the way, there is also a boat service between Punta Chiappa and Camogli. However, there are only a few during the day and the service can be disrupted depending on the sea conditions. If you envisage to do the walk only one way, the best is to take the boat first and then walk back to Camogli. 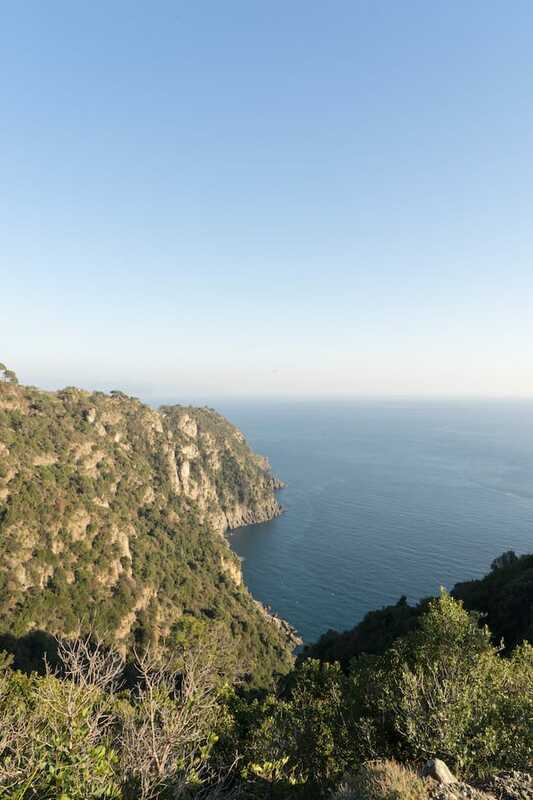 Ruta, a fraction of Camogli uphill, is one of the main access points into Portofino Natural Park, with several options for short and longer walks. 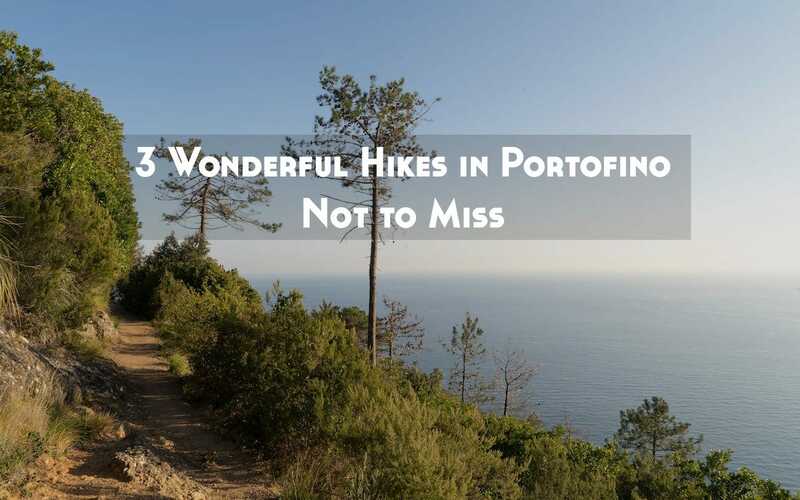 The hike to Portofino is a classic, and there are several options, a little more challenging especially if you follow the trail along the coast, where you’ll walk up and down quite a bit, before starting the steep descent to Portofino. The first stretch – marked with a red square – is easy, with not much difference in elevation. About halfway to Pietre Strette you’ll see on your right Hotel Portofino Kulm, a beautiful building with superb views of the gulf and sadly now closed. Along the trail, you’ll see different paths, and all you need is to follow the signs to Pietre Strette, a natural balcony overlooking the bay, where usually rest and refill my water bottle at the small fountain. From there, the hiking trail branches off into several paths going in different directions. 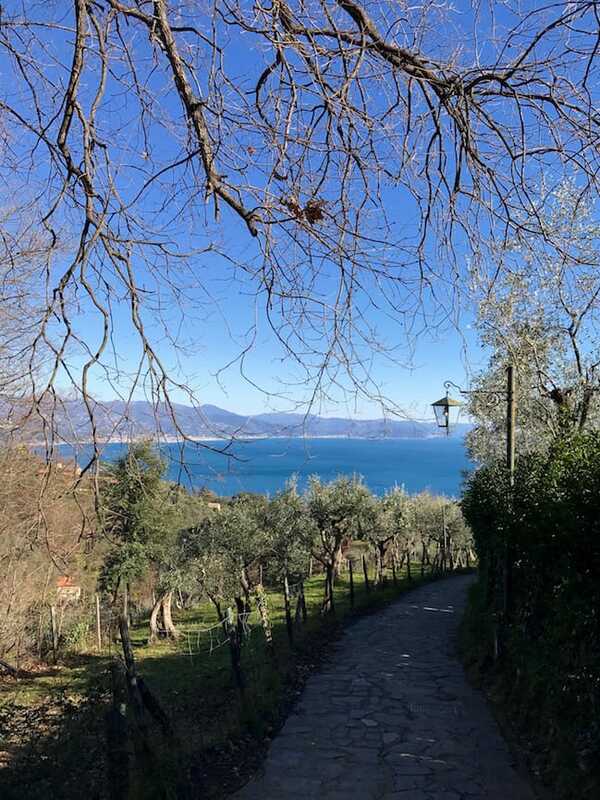 The weather was perfect, with a cloudless blue sky and a pleasant winter temperature, so I chose to walk the longer route to Portofino, following the trail that follows the coastline. I hiked up and down quite a bit, enjoying the jagged coast, wild and beautiful, stopping here and then to take in the view and snap a few photos. I’m anything but fit, thus, during the final steep descent to Portofino I could almost hear my knees cracking and moaning. It didn’t matter. I had a fantastic time. From Portofino there’s a bus service to Santa Margherita Ligure (from there, you can go back with another bus to the starting point in Ruta di Camogli). In the shoulder season, you might have to wait some time for the next bus. A good reason to have a walk in the lovely and famous Portofino. Depending on where you’re staying, from the Santa Margherita Ligure train station, there are many trains riding along the Ligurian coast. Wishing to explore more trails in the Portofino National Park, I went back to Ruta di Camogli, this time headed to Santa Margherita Ligure. 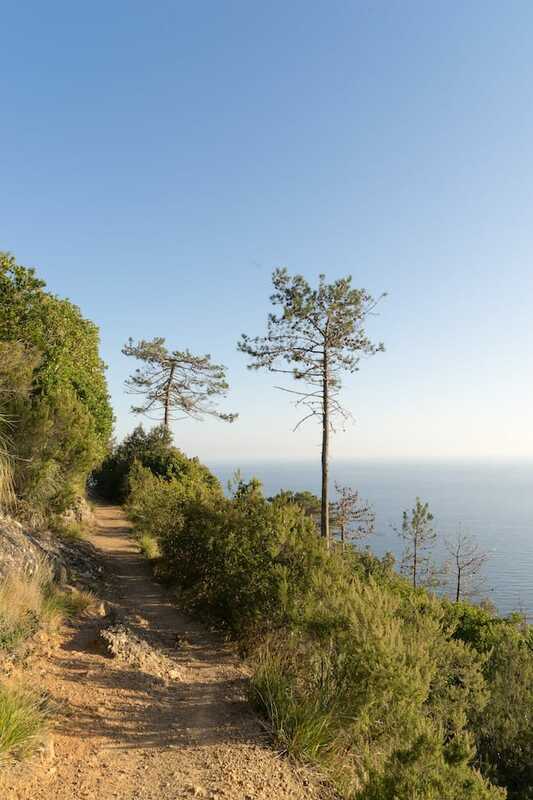 The trail is the same as the one to Portofino until you reach Pietre Strette and once there, again you have several options to reach Santa Margherita. For no special reason I decided to walk across Olmi (marked with a red square), Molini, and Nozarego (marked with a red “plus”) and it ended up being an excellent choice and my favorite hike. I was blessed by excellent weather and marveled at the many beautiful views. 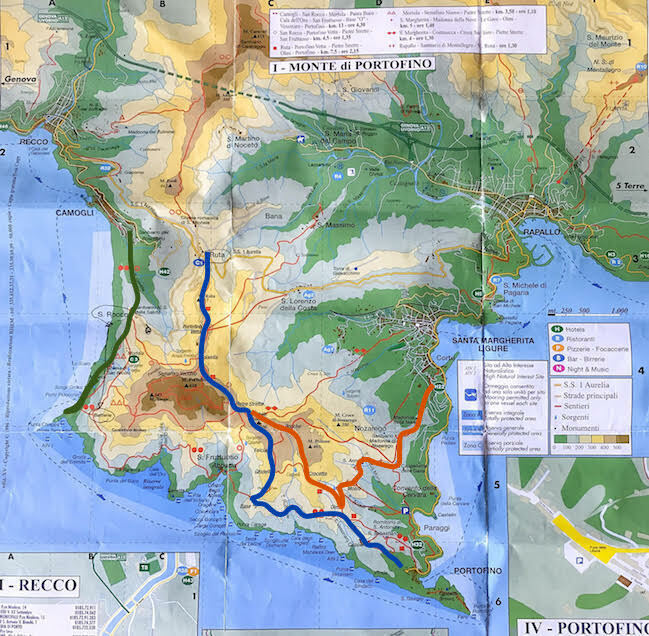 It’s hard to get an idea from a map of how panoramic a hiking trail might be, and the walk to Santa Margherita was an unexpected surprise. Hiking time: about 4 hours. From Santa Margherita there are several trains and buses connecting the towns in the area, therefore, wherever you’re staying, you can easily go back. In case you parked your car in Ruta di Camogli, take the bus to Camogli, which stops there along the way. Getting to Portofino and around: You can reach Camogli and Santa Margherita Ligure by train either from Genua or from La Spezia and the Cinque Terre. Portofino is connected to Santa Margherita by a bus service. Plus, you can also take the boat. Have a look at the destinations and timetables –> here. I highly recommend avoiding as much as possible to travel by car, since parking options are very limited, not to say very expensive. There are many trains and buses, therefore, getting around by public transportation is easy and you’ll spare yourself a lot of stress. 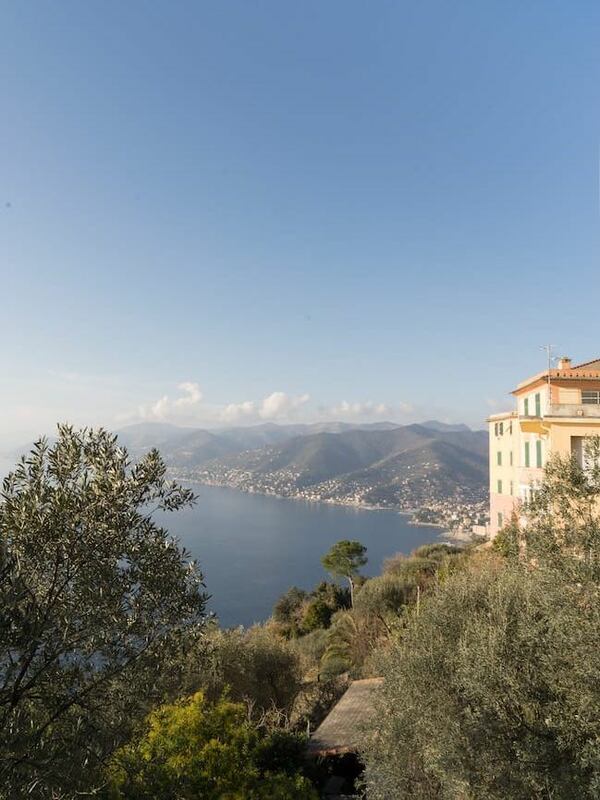 Luxury – If you’re in for a real treat and don’t mind the cost, you’ll love the Hotel Belmond Splendido in Portofino. I couldn’t afford a stay (sadly), but I went for a drink on the terrace, which has an amazing view and fell in love with it, swearing that if I’ll ever get rich or win the lottery, I’ll spend a few days at this amazing place. If you’re looking for a more affordable option, the family-run Hotel Nazionale overlooks the beautiful Portofino little harbor. It’s in the perfect location for a romantic getaway. If active holidays are your thing, this might be the right tour for you. My friend Laurel, a native Canadian in love with mountains and hiking, designed this trip after having personally done the trek (as she does for all the tours she sells). She will give you all the details and provide assistance to ensure you’ll have a great experience. This is a self-guided 6-day trip walking from across charming fishing villages along one of the most scenic coastal paths in Italy. You can walk at your leisure, take as many stops as you like, and spend the nights in a 4-star hotel. This area in Italy boast some of the most splendid coastline views. These are fantastic off the beaten path suggestions. Portofino is not just about luxury travel. There are some hidden gems in this area like these. I’m glad you liked the suggestions, Dan. All over the world, so many places are known only for a couple of things (whichever they are), while there’s always much more. The Portofino area is not only about luxury and celebrities. It’s also a beautiful natural area. Wow! These hikes are amazing. I’d definitely love to hike these stunning trails! Do you know the schedule of the boat service between Punta Chiappa and Camogli? The schedule changes depending on the season, so it’s better to check on the web. I’ve just found your blog and it’s beautiful. Theme, organization, topics, everything! Thank you, Courtney. I’m glad you like it and hope you’ll come back and read more stories in the future.